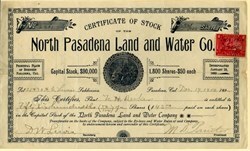 Beautiful RARE stock certificate from the North Pasadena Land and Water Company issued in 1900. This historic has an ornate border around it with a vignette of the California State Seal. This item has the signatures of the Company's President, M. D. Painter and Secretary, D. W. Lewis. NORTH PASADENA LAND AND WATER COMPANY. The North Pasadena Land and Water Company was incorporated in 1885 with a capital stock of $90,000, divided into 1,800 shares, whose par value is $50 per share. In 1880 J. H. Painter and B. F. Ball had acquired 1,800 acres of land on the east bank of Arroyo Seco, beginning perhaps 1 mile below the mouth of the canyon and extending thence eastward and southward. At the same time rights to all water flowing in the main canyon above its lower tributary, Millard Canyon, were secured. In 1887 a 10-inch by 12-inch cement pipe something more than 2 miles in length was laid to the tract. This property was all turned over to the North Pasadena Land and Water Company after its incorporation, the former owners of the property receiving stock in payment. Land was then sold, with one share of water stock to each acre, and the control of the company passed into the hands of the landowners. The old pipe line from the canyon to the company lands was replaced in 1893 by a vitrified-clay and steel main, ranging from 13 to 18 inches in diameter. The water from springs and small tunnels in the upper part of the canyon and its tributaries is collected and carried to the head of the main-canyon conduit through several miles of small iron pipe. About 1895 this company, pursuing a policy forced on the majority of the water companies owning gravity systems in the southern part of the State at that time, prepared to develop underground waters, with which to augment the surface supply. Water-bearing lands were bought, and two wells were sunk (Nos. 435 and 4.37, Pasadena quadrangle) and equipped with pumping machinery. One of these (No. 435) is about half a mile north and half a mile east of Devils Gate, and is 160 feet deep. A 35-horsepower engine and deep-well plunger pump are installed. The other well (No. 437) is about three-fourths of a mile south of Devils Gate and but a few hundred feet east of the Arroyo Seco canyon. Originally 96 feet deep, it was sunk to 135 feet in 1904 in consequence of the lowering of the water plane. The well is evidently north of the bed-rock spur which extends from the banks of the arroyo toward Monk Hill and dams back the ground waters above it. The bottom of the shaft did not reach bed rock, but probably closely approached it. The output of these two wells from July to November, 1904, is reported to have averaged 87 inches. The greater proportion of the water is furnished by the lower well, because as its lift is less it is operated more constantly. 1904 amounted to $2.78 per 1,000 gallons, or $48 per miner's inch per year. Irrigation water is supplied at 3 to 5 cents per hour-inch (miner's, not ''surface" inch), the charge varying with the proportion of pumped and gravity water. The water is distributed in rotation in heads of 20 "surface" inches (about 9 miner's inches) at intervals of thirty days. The output is apportioned in proportion to holdings of stock. An area of 173 acres, belonging to 25 irrigators, is supplied by the company. 1905 to 972 taps, at the following rates: One thousand cubic feet or less, $1.50; first additional 1,000 cubic feet, $1; each additional 100 cubic feet, 6 cents. The daily consumption of domestic water in 1905 was 1,065,000 gallons, and on the basis of four users to each tap, 3,888 people, were served and the rate of consumption was 275 gallons per capita daily. The company's pipe system includes the main-canyon conduit, 5,000 feet of 16- and 18-inch vitrified-clay pipe, 6,450 feet of 13-inch iron pipe, and about 26.2 miles of steel pipe from 1 to 14 inches in diameter in the distributing system. Two reservoirs, concrete and asphalt lined and roofed, also form a part of the system. John H. Painter and sons built a large hotel at Washington and Fair Oaks, first called The Painter and then La Pintoresca. Painter also opened up Fair Oaks Avenue all the way to Colorado Street and built a horse car rail line that ran past the hotel to the Mountain View Cemetery. B. F. Ball built the first brick house in Pasadena. Ball became a successful businessman in Pasadena and built a large house between Terrace Drive and Orange Grove, on what became the Ambassador College site.